If you want handmade unique keychains like you have never seen before, then you have come to the right place! 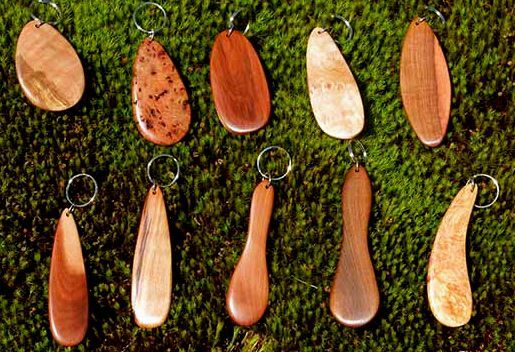 Made from rare pieces of Arbutus wood, these wood keychains will give your hand something wonderful to hold. You will find a gem in the one-of-a-kind shapes and sizes that I offer. Not only will they hold all your keys but you will have a smooth and gorgeous piece of wood to hold and touch. Touch wood! Hold your keys! And have something special all at very affordable prices for a handmade treasure. Take a look at these shapes. You won't find these anywhere else! And they come in three different grades so you can have a special gift for men or women that you can give for any special occasion. You have 10 shapes to choose from. The heights listed give you the approximate dimensions, which do vary a bit due to fine sanding differences. See the images in the photo at the top of the page or below for examples. 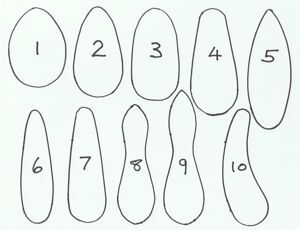 ...they sort of match the shape numbers above. (I must have erred a bit on this photo but the shapes will match the numbers when you buy!). An economical and excellent choice for a great wooden keychain. although it is hard to see the differences in this photo. They are richer and have more complex grain patterns and colors. They are also sanded a bit smoother. 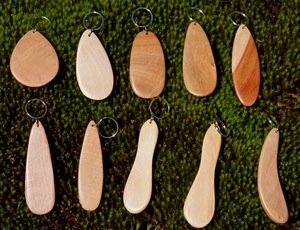 All the wood keychains are finished with water resistant natural tung oil. The image at the top of the page shows you good examples of my Supreme Selection of unique keychains. 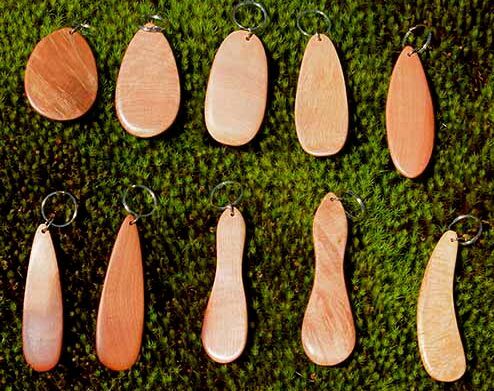 Only the rarest pieces of exotic Arbutus/Madrone wood are used to make these wood keychains. In addition to the wood, the degree of fine finishing adds a quality dimension. The higher the grade, the smoother the finish. They are all smooth, but the Supremes are, well, just extra smooth, from all the added sanding! Please click here for more details about the grades available if you want to learn more. Size: card is 2 sided with a hole in upper left corner to attach to products with a supplied twist tie. Unique keychains they are indeed and you will find them to be one-of-a-kind treasures! Enjoy the pleasure of having a wonderful silky-smooth and completely unique keychain to hold and carry your keys! 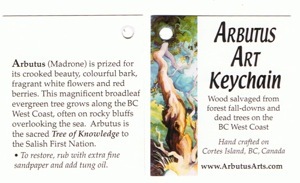 from windfalls and dead trees: Eco Friendly Wood at its best!